Implant Retained Dentures have a bite comparable to natural teeth. Denture adhesives, sore spots and embarrassing moments become a thing of the past. 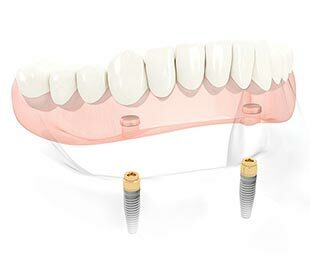 Dental implants from Changing Smiles will hold your dentures firmly in place. 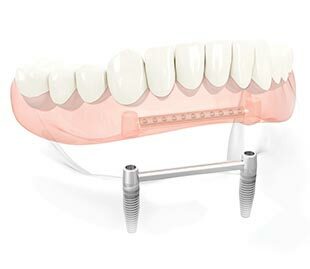 Dental implants are small titanium* screws that act as a substitute for the root portions of your missing teeth. As a biocompatible material, the implant will integrate with your jawbone in a process, known as osteointegration. This makes your Changing Smiles dentures a more natural part of you. With a more secure fit, greater stability than ever before you can talk, eat all your favorite foods and laugh freely without having to worry about what your dentures are going to do. During your consultation, together with our Implant Specialist we will assess the condition of your jawbone, the soft tissue of your mouth and your general health to determine if you are a good candidate for implant placement. 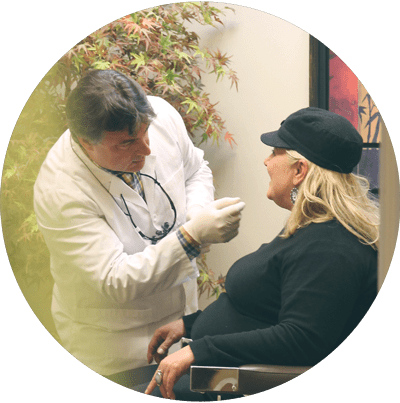 A personalized treatment plan will be presented to you after having evaluated all the diagnostic findings, that will help you make an informed decision as to which denture stabilization solution is right for you. Implant-Retained, Gum supported: This overdenture rests directly on the gums and is retained by implants placed into your upper and/or lower jaw. This type of overdenture is removable. 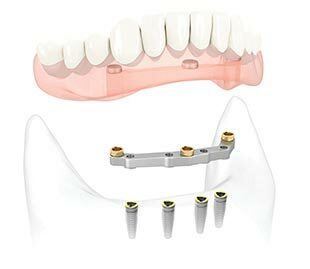 Bar-Retained, Implant supported: This overdenture engages retentive attachments on a metal bar that connects to implants, which are placed into your upper and/or lower jaw. This type of overdenture is removable. 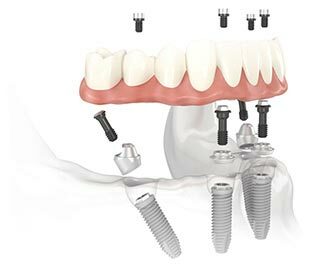 Fixed, Implant Supported: This overdenture is one-piece with a bar framework secured using screws to implants placed into your upper and/ or lower jaw. This type of overdenture is only removable by a dental clinician.